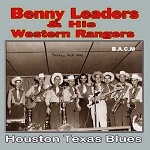 Leaders was an accomplished bass player who played with Jerry Irby’s Texas Ranchers and the Bar X Cowboys in the late 1940s before striking out with his own band. This is the first CD collection dedicated solely to Leaders’ recordings, gathering the best of his 1949-53 studio tracks plus a number of superb live recordings including a sizzling take on Lonesome Hearted Blues from 1948 and featuring legendary steel guitar pioneer Bob Dunn. - Honey Song, Farewell Blues, Close. Our first collection from the great Texas honkytonk singer features his early recordings, from his first on the Imperial label in 1952 through to 1958 when he was scoring his first big hits and already developing his shuffle sound. Hi-lights include the 1954 sessions featuring legendary session men Grady Martin (lead guitar), Tommy Jackson (fiddle) and Owen Bradley (piano) which gave us the hit recording of Tell Her Lies And Feed Her Candy. And the great shuffle classic, Pick Me Up On Your Way Down recorded in 1958 with Jimmy Dale on steel. 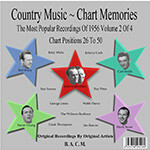 Classic recordings from the school teacher and folklorist whose songs became massive worldwide hits – including Battle Of New Orleans (Johnny Horton and, in the UK, Lonnie Donegan), Tennessee Stud (Eddy Arnold). 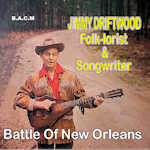 Driftwood’s song writing catalogue eventually ran to over 6,000 songs, many with distant roots into early American folk tradition. The CD showcases Driftwood’s performing talents, both as a distinctive vocalist and as a talented multi-instrumentalist on a wide range of instruments including banjo and longbow (a curved wooden bow with a string attached to its ends) as well as guitar. Tasteful accompaniment from a group of top musicians on various sessions including Chet Atkins and John D. Loudermilk on guitar and the legendary Bob Moore on bass. This collection kicks off with a few more tracks from the 1940s, recorded in New York with lush orchestral accompaniment including a beautiful rendition of Roses Of Yesterday and the first ever issued recording of Blue Eyes Cryin’ In The Rain. 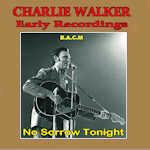 The final 20 tracks were recorded in Nashville, 1950 -55 and revert to a more stripped down, more country sound and the various session line ups include ace guitarists Chet Atkins, Eddie Hill, Grady Martin and George Barnes. 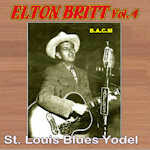 A nice mix of songs and styles – with Britt on fine yodelling form on Rotation Blues and St. Louis Blues Yodel. 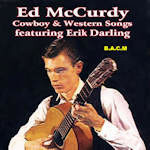 Ed McCurdy is nowadays best known as a folk singer who worked with the likes of Pete Seeger and Josh White in the late 1940s and going on to become one of the leading lights in the late 1950s folk revival, performing at the legendary Newport Folk Festivals and hosting the Greenwich Village hootenanny sessions which helped launch the careers of Joni Mitchell and James Taylor. But his career also includes successful episodes as a radio performer singing romantic songs and doing comedy routines in the 1930s /early 40s and as a children’s entertainer on radio and TV in the early 1950s. Also little known is his familiarity with and love for cowboy and western material and we are pleased to release this compilation – 24 tracks, culled from his 1957 Songs Of The Old West and other albums. They feature the guitar and banjo work of Erik Darling, a founder member of The Tarriers folk group and another big fan of the Cowboy music genre. Thanks to Country Music historian Tony Byworth for the liner notes. 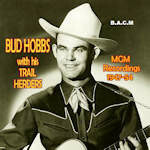 California-born Bud Hobbs was one of the first exponents of what became known as The Bakersfield Sound, but sadly died aged just 38 having left only around 30 studio recordings. These were of a high standard and featured the cream of the LA session musicians of the era including, on his 1953 sessions, Buck Owens on guitar, Ferlin Husky on bass and Tommy Collins on rhythm. Fine country-crooner voice, pitch perfect and distinctive. Thanks due to Ken Coffee and Russ Wapensky for the excellent liner notes and session details – and to Al Turner for the tracks! A fine country honker tonker with a deep drawl vocal style somewhat in the Ernest Tubb mould. BACM’s CD features most of Jack's recording output (Capitol, late 1940s and MGM, mid 50s) and includes covers of some of the popular country songs of the era including Send Me The Pillow I Dream on and Candy Kisses. Fine musicians including his brother, multi instrumentalist Little Joe Hunt, later acclaimed as ‘America’s fastest banjo player’ and who played on some of Jim Reeves’ Abbot sessions. 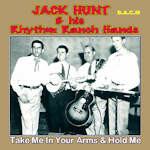 Thanks to Ken Coffee, Dave Sichak (of http://www.hillbilly-music.com/ ) and Al Turner for the research work and liner notes.